Successfully Added Stereo Bluetooth Soundbar - Built-in Mic, Bluetooth 4.2, 32GB TF Card Slot, 3.5mm AUX Port to your Shopping Cart. 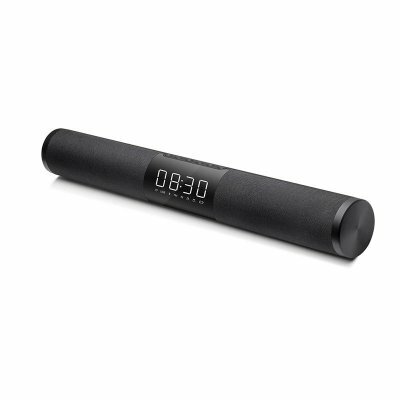 Enjoy your music through the Bluetooth 4.2 or with 3.5mm audio calbe use by this portable surrounding soundbar. Dual speakers for high performance sound and an unparalleled cinematic dep bass suround sound. It is also includes FM radio, TF card play to make it be a great entertainment device. Also it perfectly match for your TV to turn it into a complete entertainment system, especially best for home theater, enjoy the great and warm time with your family. With its an extremely stylish design make it a smooth look. Additionally, it also holds a built-in microphone, allowing you to answer your phone and make hands-free calls without the need to get up and reach for your smartphone. Holding a massive battery this speaker provides you with a stunning 8 hours of continuous play time on one single charge. From now on you can head out with confidence as with this portable Bluetooth speaker you can be assured that you will always be able to listen and share your favorite tracks with friends and loved ones no matter where you are. Additionally, this speaker also supports FM radio frequencies allowing you to listen to the latest songs, talk shows, news, and more at any time of the day. Arabic: - مكبر صوت محمول بلوتوث - Chinese Simplified: - 便携式蓝牙音箱 - Czech: - Přenosný Bluetooth reproduktor - Dutch: - Draagbare Bluetooth luidspreker - French: - Haut-parleur Bluetooth portable - German: - Tragbarer Bluetooth Lautsprecher - Hebrew: - רמקול נייד Bluetooth - Hindi: - पोर्टेबल ब्लूटूथ स्पीकर - Hungarian: - Hordozható Bluetooth hangszóró - Italian: - Altoparlante portatile Bluetooth - Japanese: - ポータブル Bluetooth スピーカー - Korean: - 휴대용 블루투스 스피커 - Malay: - Mudah alih Bluetooth Speaker - Norwegian Bokmål: - Bærbare Bluetooth høyttaler - Romanian: - Difuzorul portabil Bluetooth - Russian: - Портативный динамик Bluetooth - Spanish: - Altavoz portátil Bluetooth - Thai: - ลำโพง Bluetooth แบบพกพา - Turkish: - Taşınabilir Bluetooth sözcü - Vietnamese: - Portable Bluetooth Speaker.